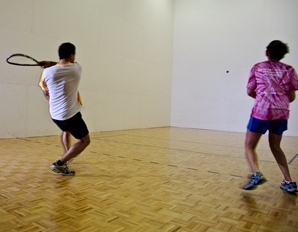 Our 2 racquetball courts are the only courts in the county open to the public. Available by appointment, these recently refurbished courts offer our members and guests hours of healthy, exciting fun. Join in on some multi-generational pick up play, or reserve a court with a friend to hone your skills, relieve some stress and have a good time. Courts may be used for Wallyball as well.